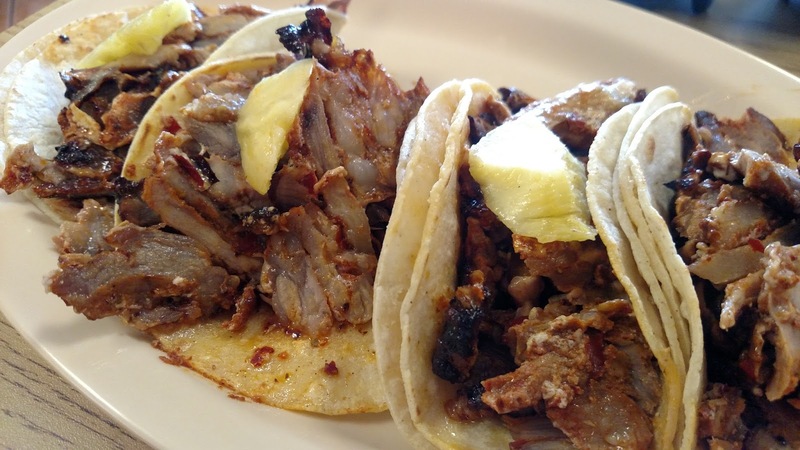 TACOS EL TIZON in Santa Maria added at ♦♦♦ One of my favorite taquerias on the Central Coast has expanded from their one location in Lompoc to a new spot in North Santa Maria and it is every bit as good at the original. Full rotisserie al Pastor with slabs of pineapple, THE BEST FRESH TORTILLA CHIPS ANYWHERE and the same full salsa-cart as Lompoc with no gringo-crap (be very VERY careful with the green stuff!). So often with taquerias, the quality and selection is inconsistent across various locations of the same establishment, but here I am happy to report it is EXACTLY the same. You just don’t have to drive to Lompoc for it anymore! MANA in Santa Maria added at ◊ Rarely do I let cleanliness influence my bets on good tacos–everyone knows some of my favorite spots are seriously in need of a good scrubbing–but this place really is an eyesore. I was early for lunch and there was already food sitting out, dried, crusty and smelling–CLEARLY from yesterday–and prep was being performed on a sink-wing. Nothing was covered, the brown radishes soaking in their salmonella pond cried out to me for salvation but I didn’t have the heart–or the stomach. Salsas were splattered all over the cart and the kitchen was literally COVERED in food. Tortillas gummy, and the meat brown and salty. Stick to the bakery next door. LOS ROBLES CAFE in Paso Robles added at ♦ I have been meaning to try this place for decades. People just KEEP suggesting it. Whenever I trot out my taqueria list, some kind soul will almost invariably point out how my credibility is completely blown by the fact I have never eaten at Los Robles Cafe. Unfortunately–after having the tacos–I can liken this to saying one’s credibility on steak is blown because of never having it at McClintock’s. These are really good tacos. Allegedly from true rotisserie. The meat is definitely grilled after coming off of the rotisserie. Very hi percentage of fat, fairly unrecognizable, brown,overly-salted and topped with a piece of CANNED pineapple. There’s nothing wrong with fat and salt in a taco–especially in a dining room packed with corn-fed white people. There’s also nothing wrong with canned pineapple–unless you know better. SALSA BRAVA in Santa Maria does the same thing. There’s just so much better out there.